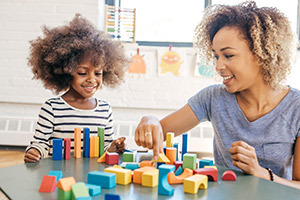 Speech-language milestones help pediatric audiologists identify potential audiological problems by assessing a young child’s communicational development. Children all learn and develop differently, so it can be difficult to determine whether a baby’s communication abilities are progressing at a normal, healthy rate. Despite huge variations in the process of early childhood development, infants typically follow some universal patterns of speech and hearing growth. Using these patterns, pediatricians can evaluate a child’s development through a set of guidelines called speech-language milestones. These communication guidelines aren’t just useful for doctors; they’re a helpful tool for parents as well. A basic understanding of speech-language milestones will allow you to assess whether your child’s language development is normal or irregular. Irregular communicational development doesn’t always indicate an auditory impairment; however, any child who shows signs of slow development should get a hearing assessment as soon as possible. Some of the most important speech-language milestones for infants and toddlers are listed below. Normally developing children should be able to perform the tasks described by the end of the milestone’s specified age range. Infants begin producing basic sounds like babbling early in their first year. By their first birthday, they string different multi-tonal sounds together and repeat familiar sounds like mama, dada or baba. Infants should respond to loud, familiar or surprising sounds (e.g. music, bangs or thuds, dog barking, their name, whistling, etc.) through actions like movement, eye contact and speech. Within the span of a year, a child’s language production should transform from incoherent babbling to recognizable speech. By age two, most children can produce about 50 words and are able to form basic two- or three-word phrases. During this year, children gain an understanding of the names of familiar objects as well as basic commands. By 24 months, children can typically understand and perform commands with two parts (e.g. touch your ear and wiggle your toes). During this year, a child’s vocabulary rapidly expands to hundreds of words. By age three, a toddler should be producing basic sentences of at least two or three words. Toddlers with normal hearing will begin engaging in communication with their parents, teachers and peers at this age. During this year, children develop the skill to differentiate between words like “over” and “under.” They also can follow more complicated commands and identify some numbers and colors. Unresponsiveness is common for this age; however, children with normal hearing should still react to loud sounds and give some response when their name is spoken. By four, a child’s speech should be complicated and understandable, even to strangers. Children of this age ask questions, use pronouns and tell stories that are a few sentences long. At this age, children recognize and respond when their name is called from another room and display a solid understanding of basic language. Your child should also be able to hear TV, movies, games and music at the same volume as adults with normal hearing. If your child is behind on any of these language development benchmarks, it’s imperative to check for hearing impairment right away. Untreated hearing loss can result in major developmental, behavioral and communication setbacks for young children. Our pediatric audiologists will take the time to understand your concerns, assess your child’s hearing and develop the best treatment plan for your child’s needs.